In order to steal a march over their competitors, savvy manufacturers in the global anti-reflective glass coatings market are seen banking on product development. To that end they are investing in research and development and also expanding their plants. They are also partnering with suppliers to boost their positions. Some of the main drivers of growth in the global anti-reflective glass coatings market are projector lenses, consumer electronics, construction, telecommunications, and eyewear industry. The high level of durability of anti-reflective glass is serving to boost their uptake in automobile and solar power industries as well. Dampening their demand, on the other hand, is the stringent norms pertaining to the raw materials used in formulating anti-reflective coatings. 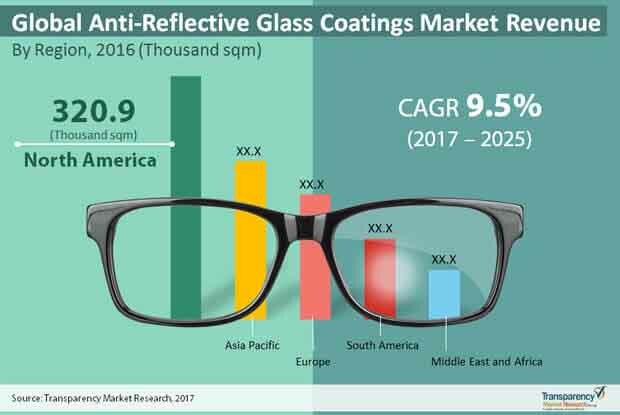 A report by Transparency Market Research predicts the volume in the global anti-reflective coatings market to expand at a CAGR of 9.5% during the period between 2017 and 2025. Rising at this pace, the market is expected to become 1,790.5 square meter by 2025. Depending upon technology, the global anti-reflective coatings market can be broadly categorized into physical vapor deposition and chemical vapor deposition. Of them, the physical vapor deposition segment accounts for maximum share in the market. In the years ahead too, the segment is predicted to retain its leading share on account of its widespread use in anti-reflective coatings. It includes electron beam evaporation method, ion beam sputtering, ion plating, ion implantation, etc. Sputtering technology is expected to witness significant growth over the forecast period on account of its superior mechanical and environmental durability along with improved precision and absorption. The two main application areas of anti-reflective coatings market are large area glass coatings and small batch coated lenses. The large area glass coatings can be further segmented into picture frames, electronic displays, refrigerated displays, solar, automotive, and others such as architecture and museum show cases. The solar sector primarily powering growth in the large areas glass coatings market and will likely continue its dominance in the future as well. The small batch coated can also be further divided into eye glasses, optics, etc. From a geographical standpoint, North America accounts for maximum market share in the global anti-reflective coatings market, which it is expected to hold on to in the next couple of years. Growing demand for innovative products in anti-reflective coatings and subsequent investments by manufacturers in research and development are serving to catalyze growth in the market in the region. In April 2017, for example, DSM unveiled an anti-soiling coating for the solar glass which helps to lower damages from dirt and dust. By clocking a healthy 9.7% CAGR from 2017 to 2025, the volume in the market is predicted to reach 670.8 square meter. Asia Pacific trails North America market in terms of volume. By registering maximum CAGR of 9.8% in the forecast period, the volume in the market is expected to become 440.3 square meter by 2025. Increasing demand for anti-reflective coatings from the electronic industry, mainly in the fast-expanding large economies of China and India, is proving to be a boon for the market in the region. Europe is another key market for anti-reflective glass coatings on account of thrust on energy efficiency in the region. The Middle East and Africa and South America collectively accounted for about 20% in 2016. Some of the key players in the market are Anthony International, Guardian Glass, Falkberg, Schott AG, Saint Gobain, Honeywell, PPG, Truvue, and DSM. The global anti-reflective glass coatings market report provides analysis for the period 2015–2025, wherein the period from 2017 to 2025 is the forecast period and 2016 is the base year. The report covers all the major trends and technologies playing a key role in anti-reflective glass coatings market growth over the forecast period. It also highlights the drivers, restraints, and opportunities expected to influence market’s growth during the said period. The study provides a holistic perspective on the anti-reflective glass coatings market’s growth throughout the above mentioned forecast period in terms of revenue (in US$ Mn), across different geographies, including North America, Europe, Asia-Pacific, Middle East & Africa (MEA) and South America. The market overview section of the report demonstrates the market dynamics and trends, such as the drivers, restraints, and opportunities that influence the current nature and future status of this market. An attractiveness analysis has also been provided for every geographic region in the report, in order to give a thorough analysis of the overall competitive scenario of the anti-reflective glass coatings market, globally. Moreover, the report provides an overview of the various strategies of key players present in the market. Introduction and market definition chapter helps in understanding different technologies of anti-reflective glass coatings along with their applications which are included in the report. . A standard anti-reflective glass with the minimum reflection of on both the sides transmits about 98% of the light and produces only 1% of residual reflection. The advancements in deposition technologies such as thin film fabrication and development of new coating materials are increasing the use of anti-reflective products in various applications. The report segments the global anti-reflective glass coatings market on the basis of technology into physical vapor deposition and chemical vapor deposition. The report provides in-depth cross-segment analysis of the anti-reflective glass coatings market and classifies it into various levels, thereby providing valuable insights at the macro as well as micro levels. The anti-reflective coatings are widely used in various end-use industries owing to improvements and rapid developments in optical coating technology. The anti-reflective glass coatings market is segmented by application into large area glass coatings [picture frames, electronic displays, refrigerated displays, solar, automotive, others], and small batch-coated lenses. The report also highlights the competitive landscape of the anti-reflective glass coatings market, thereby positioning all the major players according to their geographic presence and recent key developments. The comprehensive anti-reflective glass coatings market estimates are the result of our in-depth secondary research, primary interviews, and in-house expert panel reviews. These market estimates have been analyzed by taking into account the impact of different political, social, economic, technological, and legal factors along with the current market dynamics affecting the anti-reflective glass coatings market’s growth. On the basis of country, North American market is divided into The U.S., Canada, Mexico and Rest of North America. Similarly, Europe market is divided into Germany, UK and Rest of Europe. Asia Pacific has been segmented into China, India and Rest of Asia Pacific. Middle East and Africa covers the Saudi Arabia, UAE and Rest of Middle East and Africa. Similarly, South American region includes Brazil and Rest of South America. This report provides all the essential information required to understand the anti-reflective glass coatings market. Furthermore, Porter’s Five Forces analysis explains the factors which are currently affecting the market. This report also provides the value chain analysis for the anti-reflective glass coatings market which explains the participants of the value chain. Some of the key players engaged in anti-reflective glass coatings market include DuPont, Honeywell International, PPG Industries, DSM, Asahi India Glass Limited, Guardian Glass, Essilor, and Schott AG. Details such as financials, SWOT analysis, business strategies, recent developments, and other such strategic information pertaining to the industry has been duly provided.